OPENS FRIDAY 16th OF MAY AT 5 PM. Huginn: We’re sitting here in Kling & Bang on 5 May 2008, Huginn Þór Arason, Daníel Björnsson and Sirra Sigrún Sigurðardóttir. We’re here to discuss your exhibition at Kling & Bang gallery for the Reykjavík Arts Festival. Maybe you can explain what you plan to do? You’ve got a sculpture and installation in many parts, in many layers, even. It would be great if you could start by telling us about the basic elements of the exhibition. S: There’s going to be one main structure made up of many units that sits on a floor plan, then there’s a large picture that covers an entire wall, and then there’s a video over the whole thing. S:Yes, all over the hall. H: Your sculpture will be made of Plexiglas, coloured Plexiglas. I envision it as a kind of wave, or what can we say … like a scientific graph, a mathematical curve. S:Yes, you can interpret it in many different ways; it’s a shape we’re all familiar with. S:Some kind of 3D bar graph. D:I get the same feeling from it as when I see a rising curve, a logarithmic scale. H: Yes, didn’t you find this picture on the internet? You tend to work a little … like, you do research beforehand, you’re working with information that already exists or is given. S:Exactly, this is based on a tiny .gif image of a histogram. I then make it into a drawing, then into a three-dimensional form, then again into a drawing, then again into a three-dimensional form, and along the way I add my own colours and sizes. I try to work at it until it has been placed in a new context and has gone through many different contexts along the way. H:And these colours, they remind me of the rainbow, they’re the theoretical spectrum. S:Yes, the original little picture had no colour, but after I started working with it I added colours, and I then saw that, without thinking, I had put the rainbow, the light spectrum or prism over it. I had automatically added that rule over it. H: You’ve worked with it a fair bit in the past; can you explain briefly why you do that? Why you choose this basic structure in the colour spectrum? S: It’s just the basic … it incorporates all possibilities and you can see it as a scale that has built-in, readable information. This colour scale, for example, is the basis of how we understand the development of the universe today. The theories about the expansion of the universe are entirely based on reading the light that we receive from the stars. H: You’re interested in base forms and systems, the tools that are given. S: Yes, you could call it morphology. H: Morphology, it lives on. Which brings us to … if we just work our way through this, we see more basic principles of fine art. Ideas about balance and tension and, for example, abstract painting that has been developing for a century or more. Can you tell us something about that? S:Abstract painting? Yes, I find it very exciting (everyone laughs) yes, I think I’ve always been more interested in it than realistic painting, for example, and I’ve always had a certain respect for those who work in it. I find it fascinating that often complex and even highly spiritual ideas underlie simple outcomes or presentations. D:Perhaps it is this link that Huginn is looking for, that is, the basic ideas. Different materials may be used, but the ideas that underlie abstract works and your installation overlap. H:Yes, there’s some kind of effort to create patterns that already exist, even scientific patterns, or at least that’s what springs to my mind. We are talking about prisms, graphs … scientific ways to present information. This is connected – at least in your work – to the development of abstract painting and other work, perhaps. S:Yes, the pot that I’ve been fishing around in is one thing, but then it is also interesting to look at why one nevertheless returns to the same basic elements in the execution. In the actual process you have so many choices … which route to take. H: So maybe it would be interesting to look at what is in your pot that guides you onwards in the execution; can you explain that a little? What is in the pot for this exhibition? S:We all have our own sense of aesthetics, which has to act as some sort of guiding light. You go through a lot of material, and then you choose something, which must be based on this sense of aesthetics in the widest sense, or at least I allow mine to guide me. I am perhaps talking about visual material in the pot, in particular. But the basis of what you examine, what you are digesting, may be completely different. For the past few months I have been looking into astronomy, mathematics and physics, the history of theoretical concepts and ideas that we take for granted today, or that are part of our world view. And examine how these concepts evolved, I haven’t necessarily tried to understand the mathematical formulas themselves, but rather the thought process behind the search, the desire to understand the world. How it is done and how it is presented, that process. H:Are there any particular concepts? S:For instance I am interested in what is happening today in string theory and the possibility that we live in a multiple universe. S:Yes, some of the theories are based around that. Also how things become simple, in a way, when you’re down to their smallest components. H:What about string theory, can you explain that a little? S: No, I don’t really understand it, but I find it very interesting how scientists have arrived at this conclusion. That the world is made of these strings. But it’s hard to understand. H: Is it like some kind of tapestry, is that the idea? S: Yes and no, it’s this idea about strings in the smallest component of matter, that is, the quarks … those strings are in there somewhere. The idea is that the entire world is based on different frequencies, vibrations of those strings. That’s how I understand it; maybe the universe is just a symphony. For this theory or calculations to work we need to live in a world that has 11 dimensions. But it’s not possible to understand all those dimensions except as numbers, mathematics. D: Except for three dimensions, and time. S: Everything beyond that has to be expressed in numbers. And all this is something that fires my imagination. D: Then there’s also this large chart that you have, that shows developments over ten thousand million years …. S: Yes, I see it as a picture of everything, or an attempt to show a vast amount of information in one picture. Another thing that’s maybe interesting about information, we really don’t have a choice when it comes to our world view; we have to build on that which is said at any given time. And it changes all the time, nothing is static, nothing stays the same always. The status quo doesn’t exist. H: Which is also a theme in your work. You once said that you couldn’t standthings that are static. S:I have a tough time letting things be still, they have to revolve, or flash or something. H:Yes, it’s a particular vision. D:A restlessness in the sculpture. S: It’s interesting that, no matter what the sector or profession,the experts have to agree on some sort of picture, model or paradigm. H:Yes, have some sort of agreement. S:And then you can move away from the paradigm, it is studied based on this predetermined fundamental picture. H:Exactly. Are you perhaps trying to base your study on this predetermined picture? S: No, it’s not like that, yes, I must work within some kind of framework, that’s permitted in art, although of course it has been broken up a lot, there is always some kind of framework, some set of rules. H:So you arrange together different systems, or information and ideas that are linked. You give yourself freedom to link things. I’m thinking that you’re trying to find a common point. What can we call it? A vantage point? S:Yes, a lot of ideas come together there, although they have been transformed somewhat. In a way it’s like the idea is no longer there. I don’t really know how to explain it. When you’ve pushed many things into one thing, the idea is no longer what it was. H: Yes, isn’t it kind of like that? One assumes that it’s some kind of continuation of a system. Take for example your exhibition Hreyfingar/Movements in Kling & Bang in 2006, where you explain movement, or, the way I experienced that exhibition, frankly speaking … it was some kind of systematic way to explain a type of visual activity. D: On the one hand there was this graph with an animation showing how wind splits on a block, and on the other hand, at the other side of the space, you had a flagpole and projected silhouette of the flagpole, which didn’t correspond to the fluctuation/movement as it was in reality. So, the replica or silhouette of the flag was in opposition to the actual object, creating some kind of tension between the actual object and the replica. On the one hand there is this graph that depicts the invisible … there is something about depicting something that is not visible, although wind is very tactile. On the other hand you have a flag that flickers in the wind, but the two don’t fit, don’t go together, don’t compute, meaning that some kind of tension is created between the two. H:It was a certain point that as a spectator one felt physically, which puts one in some kind of category. It’s hard to explain, it’s a series of things that come together, and you, the spectator, somehow wind up in the middle. D:Then there’s this factor that gives the exhibition pizzazz, this perpetual movement, no two moments in this installation are the same, so your experience as a spectator is never the same. Which is very interesting, there’s some kind of random force in the installation, suddenly the human being – irrespective of who it is – starts to matter such a lot. And it does not necessarily have to do with your position within the space, but rather with time. When are you in there? - That’s the moment. H: You become active in the process of piecing it together. You become a block in the graph. D: I just realised some kind of metaphysical context for this exhibition. It’s Plato’s cave; the replica, the fundamental image. S: Yes, the Reykjavík Art Museum wrote something of that sort about me for the exhibition The Apostles Warehouse (Pakkhús Postulanna). I hadn’t realised it myself but it’s obvious when someone points it out. I always thought about the replica of the replica, but hadn’t gone that far back in the history of philosophy. At that time I was thinking more in a context of time, how things, or more specifically, history, repeats itself, but can never be exactly the same in each repetition or cycle. H:At which it occurs to me that there is often a kind of repetition in your work. S:Yes, I’ve had fun with that, playing with and using the same symbols or objects, continuing on with them, putting them in new contexts with something else, at which they are transformed into something different. D:New circumstances. Your work is very site-specific. In a way you work based on the space that you are allocated …. S: Yes, I now find it most exciting to work with the space itself and things that come from there, that is, the exhibition space. Both actual objects and atmosphere or new circumstances in each place, mixed together with something I bring. D:It requires a certain take over of the space itself, you completely rein it in and take control. D: I think in this context, even though people don’t know your older work, when one walks into the space one still experiences a context or continuum. You feel it’s some kind of ball that’s rolling, some kind of study of the world of forms. H:Yes, something in this work is familiar. One senses that it’s an explanation or that there’s background information, something one may know from academic texts. S:Yes, or election results on TV, or surveys, for example. H:Yes, or from the banks, which is also a kind of inversion. S:I find it interesting to use this language, which has been agreed upon as a means of communicating information. To look at how it works when you take it out of context or how it changes into something else. H: Maybe it changes into its own particles. S:Yes, when you strip it down. The choice of the picture that the exhibition now in Kling & Bang has formed around is also a dialogue with art itself, or its surroundings. H:As instruments and tools and communication of information? S: No, or well, yes, that too, but rather these are characteristics belonging to it, for example this is like pedestals used to prop up art, while the traditional artwork is missing. And yet they are there as a manifestation of how gravity operates. There are many foundations for art. The chess board is also a foundation, or a playground. D: Let’s look at chess a bit more, since it’s one of those threads that you’ve used in the past. What exactly are you looking for in chess? S:I don’t play chess, myself, but there is something about that system that gives endless possibilities while still having certain rules and which is predictable to some people, but not to others. H: Yes, these rules, there are certain initial moves. D: It’s also something else; I was out in the countryside this weekend, driving, and was thinking about the Icelandic word skák (chess). Skák just means ‘delineated area’. When ditches are dug, the areas between the ditches are called skák (chess). S: Yes, it can also just be a pattern. Maybe it only becomes a chess board if you count the squares. H: You had such a strong connection to the body before, is that something you feel you’re moving away from? S: Well I think it is somehow there. I think it is always underlying and will pop up again. It’s part of the way the work takes over the space. For me it is directly connected to a physical element. By walking into the artwork you create the possibility of experiencing something other than just intellectually. You open up another kind of perception than the kind you have, for example, when you look at a static picture. H: You have also linked this physical element to acrobats, how they use one small point on their bodies to gain a kind of balance. To me, it’s like you’re referring to that like some kind of power we have, to stay balanced. S: For me it’s symbolic of so much. You could say that this is an experiment in using the human body as language, because everyone understand the body, it’s something we all have in common, we all live in a body. Maybe it’s one of those basic forms. S:Yes, it’s just a circle. H:Is there something in this current exhibition in Kling & Bang that you specifically connect to this? S:Not directly, I think it’s fairly submerged at present. It would only be in how the exhibition is set up in the space. The body is not present, that is, visible in the work itself. But you’re always working with human sizes. H: Let’s briefly talk about language. We have words written here on paper:time, conditions, connections, leap, Duchamp, Dark field, General soup, symmetry, emptiness, verbal overshadowing, Fabric of Reality, mirror, spectrum, light, gravity. All are taken from texts that support scientific ideas. S: Yes, these are just a few words that ended up together on a page, but which become so open and enjoyable when you take them out of their linear context. D:They become so open to interpretation if you place them in an abstract context. S:In and of themselves they are very creative. H: It’s nice to reflect that this can stand completely alone as a discussion about art. We could just sit here and discuss the Fabric of Reality, what is beyond the veil, the drapery. S:Yes, like transferring ideas from one field to another. H: Also, when you think about how progress occurs, for example in technology and philosophy. Some kind of vanishing point is created when certain objects are put together, a point that one understands. It’s like the world collapses, comes into focus, and at the same instant there is an opening backwards in time, that which has already happened, but then ideas also come up that allow you to move forward by one square. It is those points where things connect. They can give you ideas about how progress happens and directs one’s thoughts to the different routes taken by artists or how artists work. At the same time you are pulling something together, affixing something, and at the same time somehow all the doors open at once. It reminds me of a quote by Sarah Lucas where she says that artists are imprisoned, or rather that they are always trying to dig their way out through a tunnel. S: Yes. I’m probably always digging ditches, creating skákir (chess). H:Always digging from certain points and placing things in sets. S:You’re talking like a mathematician now. H:Yes, placing things in sets, connecting the sets. S: I kind of want to talk about this as a drawing. H:That’s an interesting point, because one experiences this perhaps more as a painting. D: Yes, I see it more as a painting. You talk about the work as a drawing, what exactly do you mean by that? Because you as a spectator walk into the space that has a profusion of colours and, as if that were not enough, they are all moving, they completely take over the space and paint it. But you say drawing? S:Yes, I have been thinking about this question, whether this is a painting or a drawing, even though of course it is neither. To me it’s more like a drawing, maybe because I’ve worked a lot on the computer for this exhibition, during which I am drawing and not painting. D: So it’s more of an emotional connection. S:Yes, but I also made drawings on paper, I had to refresh my memory when it came to the old perspective drawing. To sit at home and draw with a pencil, that’s probably why I feel this is a drawing. D: Maybe it’s because the three-dimensional drawings are in a coordinate system, but for me as a spectator they’re not visible. Maybe that’s the basis for the exhibition. S:So the drawing is more like a sketch. D: But on reflection, the sculpture in the middle is much like a drawing. Boxes that form these clean lines, but maybe they can also be viewed as one layer of many. S:Yes, there are many layers that go on top of the basic drawing, the video shows the space and the work itself and in that way it is projected over itself. It creates a sort of extension and at the same time a light-picture of the sculpture through the glass. H:So a replica of the sculpture is projected, so it is multiplied? S:Yes, I hope I’ll be able to multiply it. One of the most active artist-run spaces in Reykjavik, Kling & Bang, is hosting, on the occasion of the Reykjavik Arts Festival, an exhibition by one of the gallery's founders, Sirra Sigrún Sigurðardóttir. 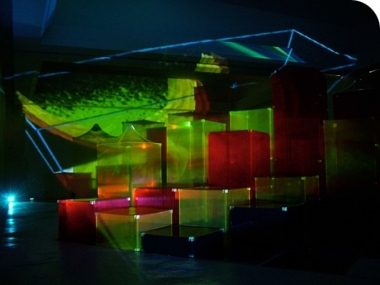 Titled “Uncertainty Principle,” it is an elaborate installation that occupies the vast space and integrates sculpture, video projections, and a photograph. A large construction made of colorful Plexiglas cubes stands atop a black-and-white chessboard drawn on the floor. The cubes rise from the ground, sketching the surreal skyline of a psychedelic town. In their stunning elegance and sensual forms, they suggest a futuristic museum in which the objects on display have gone missing. Surrounding the sculptures are three enormous video projections that animate the gallery walls with shapes and graphs recalling impenetrable mathematical equations or vintage sci-fi movies. Some feature found footage of old scientific experiments downloaded from the Internet, others computer renderings of the Plexiglas sculpture. As in a hall of mirrors, the projections and the sculptures reflect one another, creating an optical confusion that makes the experience of the piece even more hypnotic. On the left wall, a large-scale digital print depicts multiple waves of colors: The artist found an old scientific graph about evolution, from which she removed all the text to leave nothing more than sinuous curves of different hues. The installation evokes a parallel world, a walk-in Neo-Plastic abstraction defined by the infinite possibilities of composition and color.